Make weeknights less stressful with this easy, spicy, Thai-inspired storecupboard recipe made with minced beef. Cook the rice according to the pack instructions, then spread over a tray to cool. Heat a little oil in a large frying pan. Crush in the garlic and sizzle gently for a couple of minutes, taking care not to let it burn. Add the beef mince, chilli flakes and the fish and soy sauces. Turn the heat to high and fry for a few minutes, breaking up the mince with a wooden spoon. When the meat is cooked, remove the pan from the heat. In another large frying pan, heat a little more oil over a high heat. Crack in the eggs and leave to set for a few seconds, then push them around the pan with a spatula to break them up. Add the cooled rice, season, then toss over a high heat until golden. Return the mince to the hob to reheat quickly, then squeeze the limes and add the juice. Taste and adjust the seasoning if necessary, then toss through most of the coriander. 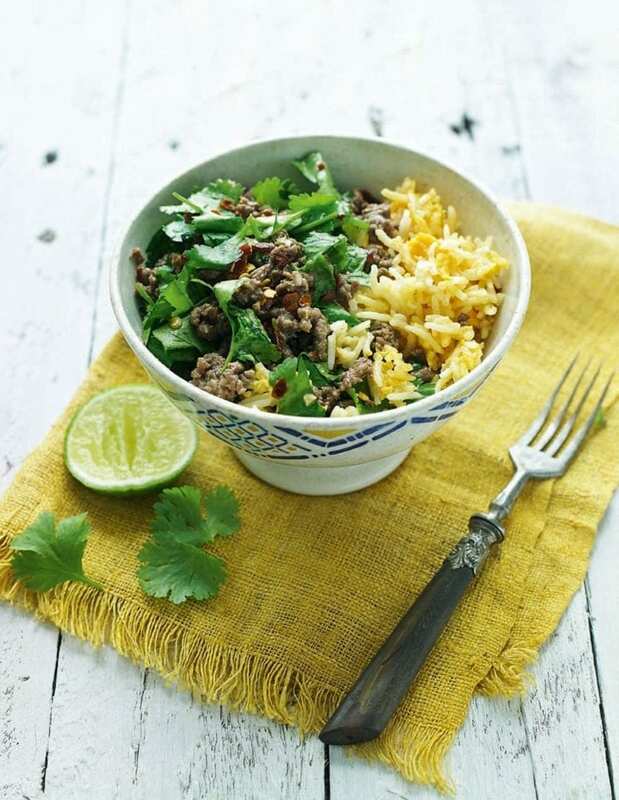 Divide the rice and beef among bowls, then serve garnished with the remaining coriander. Red alert; how much red meat should we eat?